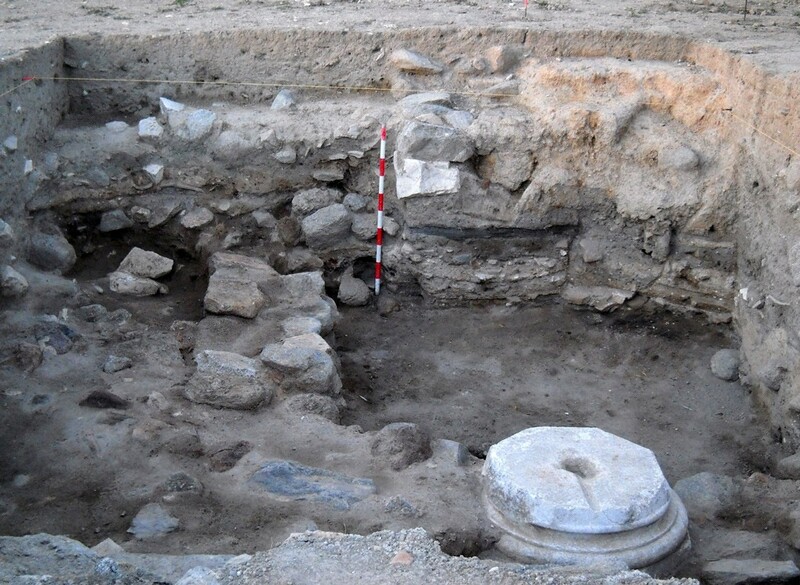 The remains of a Visigoth building (7th – 8th centuries) have been discovered in this place. 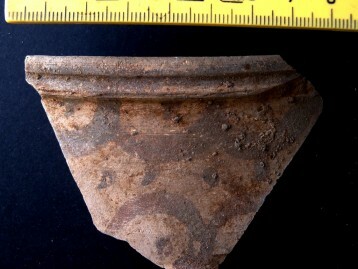 It may have been part of monastery related to the basilica church located in Area 3. 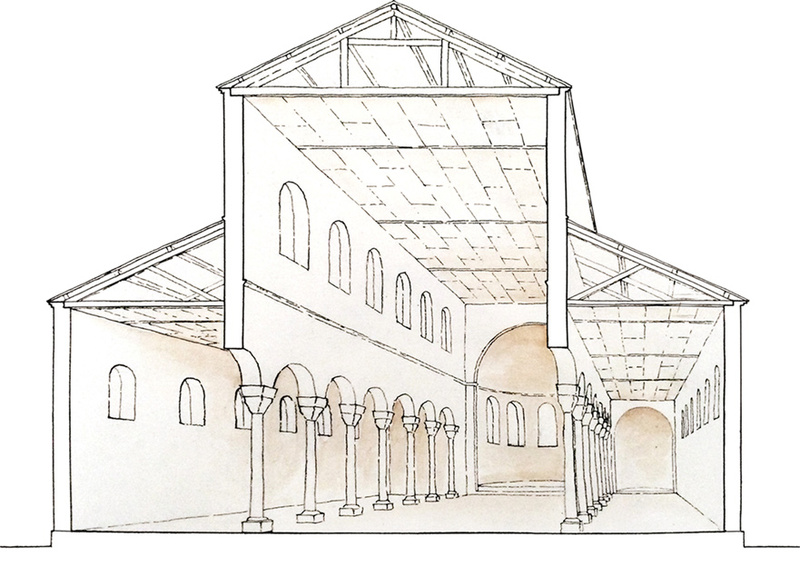 The fact that we could discover this building give us a major input for knowledge of potential Visigoth monasteries, since very little is as yet known about them. 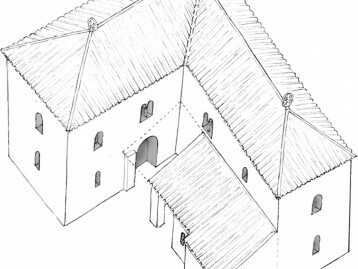 Like the building of the basilica, this one was occupied over the 8th and 9th centuries. 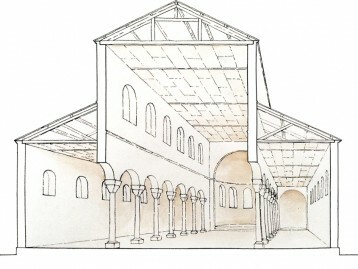 Its inhabitants did not only maintain it, but also dismantled some of its structures, while letting other ones collapse. 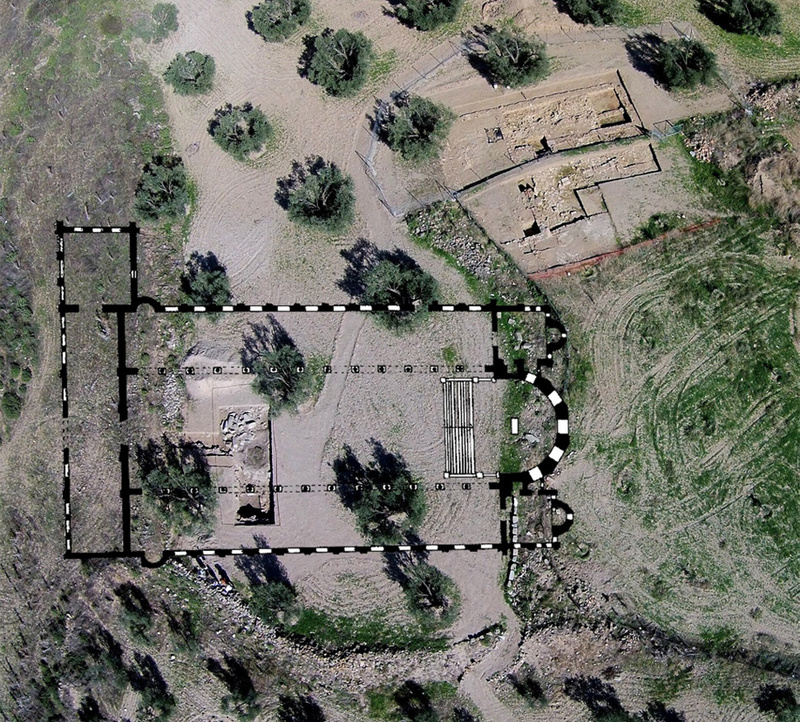 Some of the characteristics of the structural ruins discovered in area 1-2 suggest that the building would have been two storeys high, organized into two big areas arranged in an “L” shape. 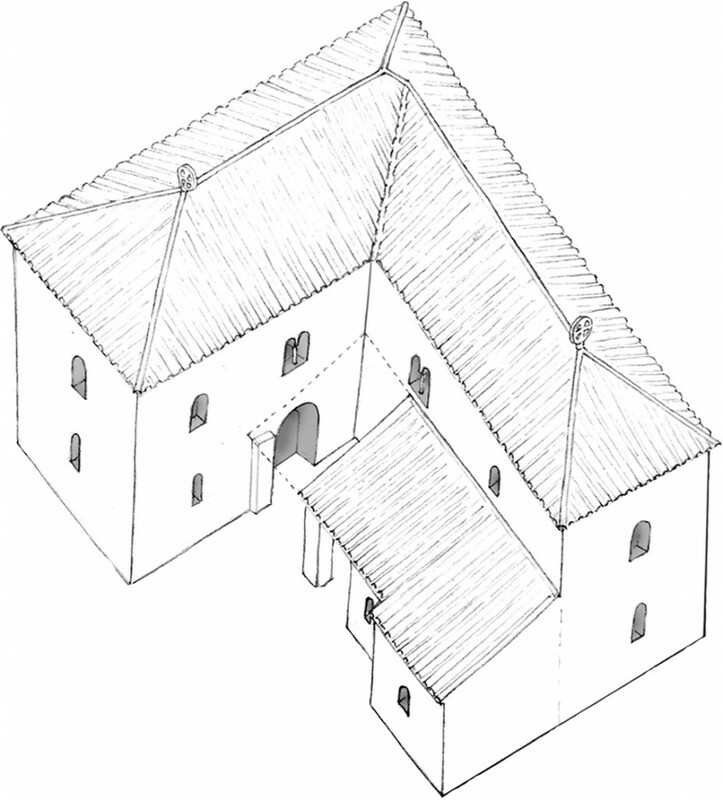 On the ground ﬂoor, two further small rooms and a porch were added, with the latter one acting as a means of communication among all rooms. 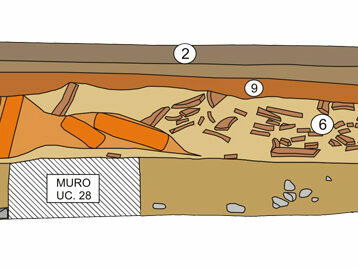 Process image of excavation of remains of the building discovered in area 1-2. 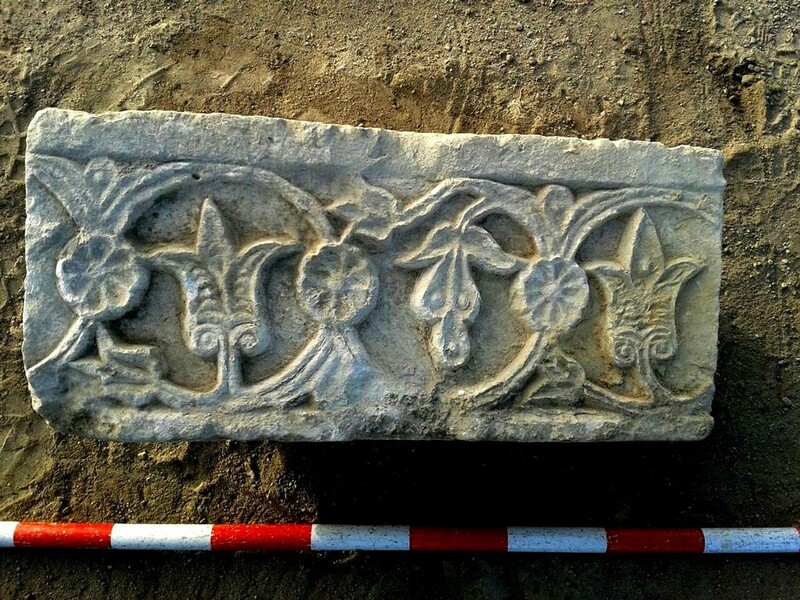 Supposed stone reliquary for holy oil made of limestone. 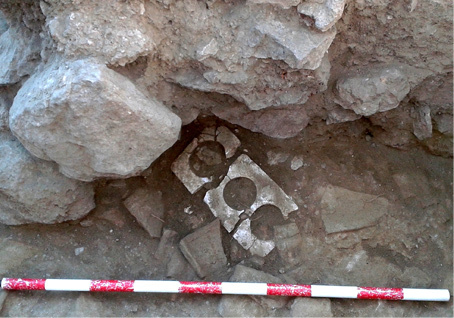 Its presence among the remains of the building, together with a laurel ringed cross, reinforces the view that it is a monastery linked to the Basilica discovered in area 3. 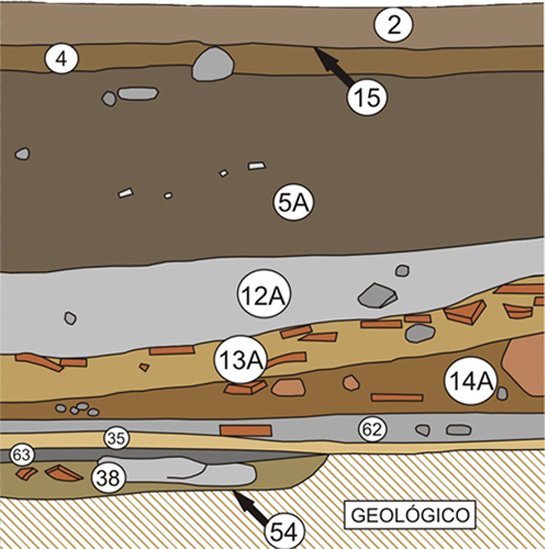 Plan drawing of the building discovered in area 1-2, showing stratigraphic soundings. 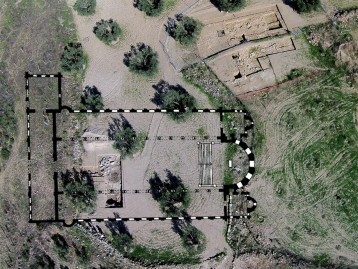 A drawing plan of stratigraphic proﬁle in Sounding 2 (Space 2), displays an overlap of structural ruins that helps us to understand how the east wing of the building collapsed, The fact that several complete adobe bricks have been documented suggests that the walls of the upper ﬂoor were constructed with this material. In area 3, many structural ruins belonging to a monumental building have been discovered and, due to their features, that they belonged to a Visigoth Basílica (6th – 8th century). The hypothesis that a basilica had existed at this site during the Visigothic kingdom of Toledo, is supported by the presence of large numbers of granite ashlars, together with two marble bases (encountered in their original position), pieces of capitals and marble shafts, friezes decorated with plants and geometrical motifs, etc. 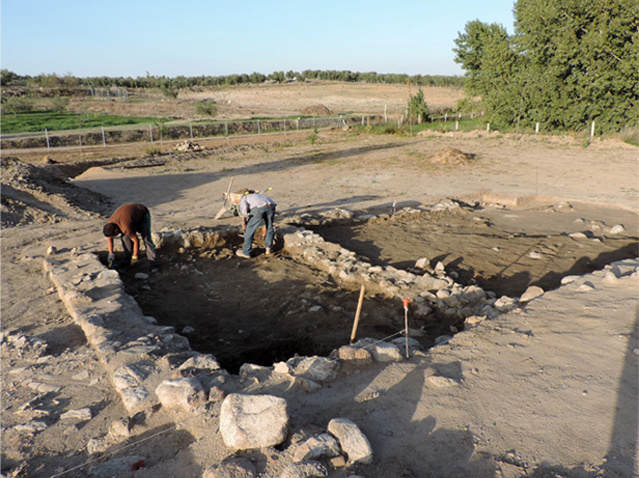 Dismantling and ransacking of the structural ruins probably took place between the 8th and 11th centuries, caused by a radical change in the type of activity that must have happened after Arabs invaded the Iberian Peninsula in the year 711. 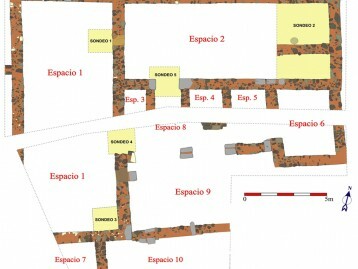 Aerial photograph of excavation areas 1/2 and 3 (by the end of 2014), showing the hypothetical plan of a basilica. 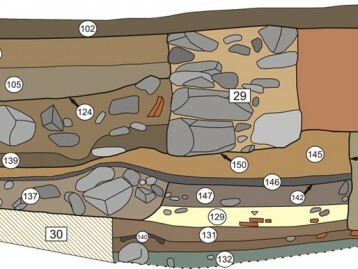 In this drawing of one of the stratigraphic proﬁles in the area 3, some structures (foundations of the building, graves, etc.) 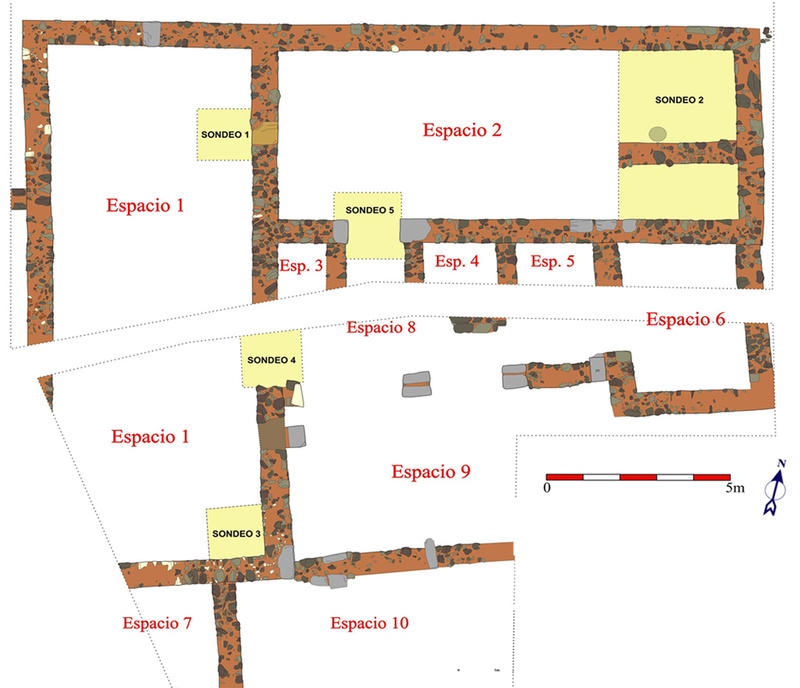 and stratums (ﬂoors and remains from the collapse of buildings) belonging to different constructions that occupied the space from the basilica during the period of Al-Andalus (8th - 11th century). 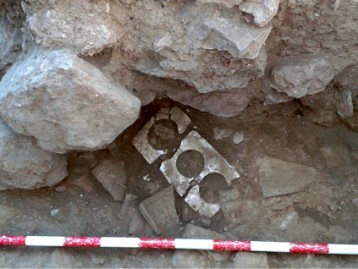 Photograph of the southern part of Area 3, with one of the marble bases with the foundations of a construction belonging to the Emirate (8th to 9th century). 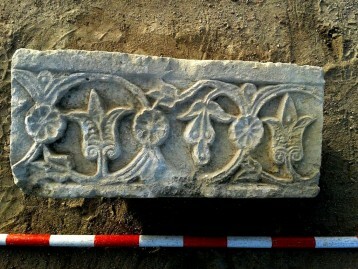 Fragments of the friezes decorating the basilica. 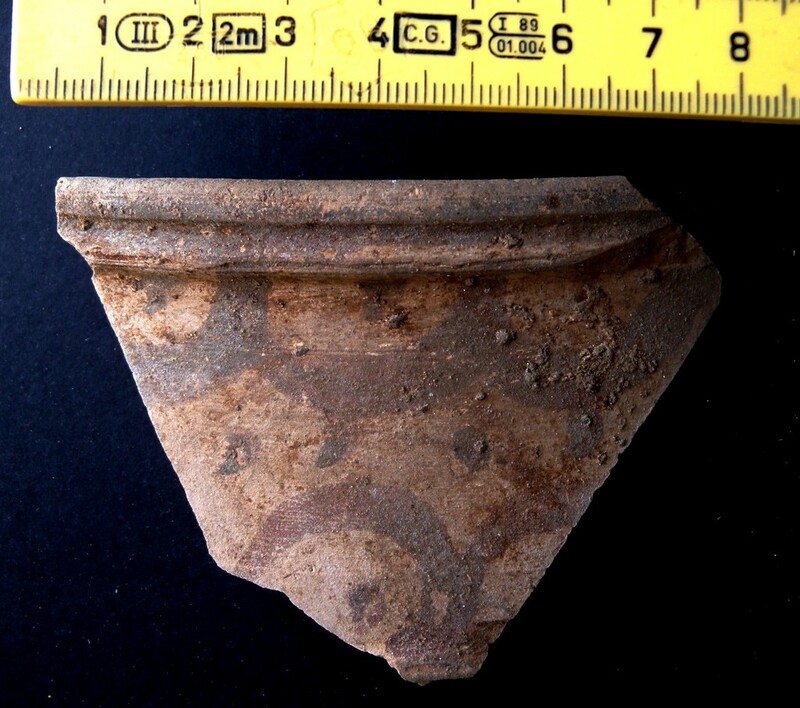 Shards of painted clay vessels belonging to the Emirate (8th - 9th century). 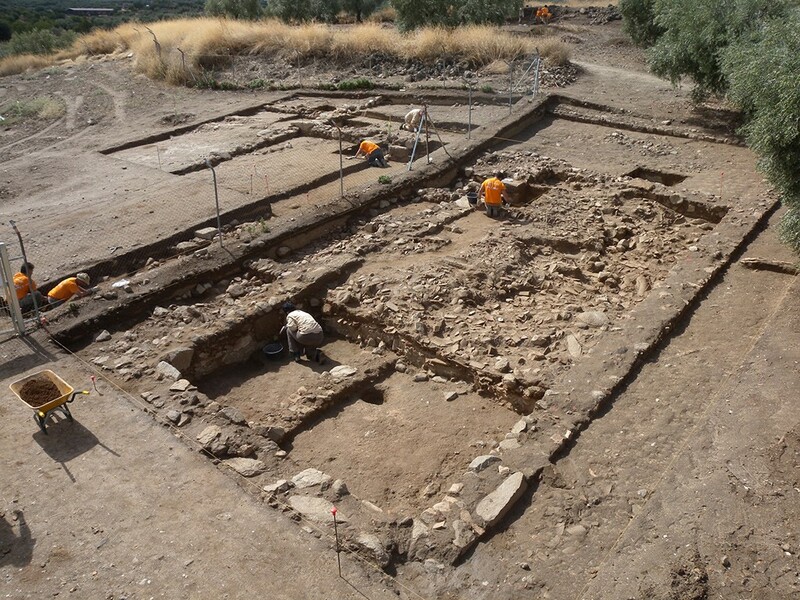 Some remains of walls belonging to a big building with a rectangular base, probably from the Visigoth Age, have been found in the area of the old Guarrazar fountain, located between the two paths crossing the archaeological site. Its interior has been carved into the natural rock and from which the waters of the fountain ﬂow. 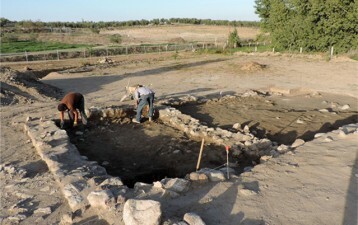 Process image of the excavation of the remains of the building discovered in the zone of the wellspring. 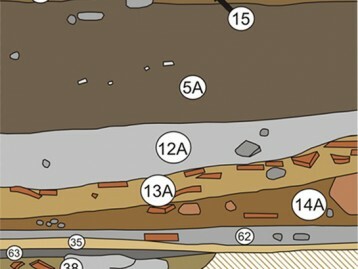 Remains and situation of the wellspring, water basin and the place where the treasure was found.